Here’s the truth: I accidentally organized the cash mob for Avi. This was the first thing I looked into for a couple of reasons: I didn’t know if Avi would hate or love it, or if there were cultural mores I should be aware of. I didn’t want to embarrass him or make him mad. So I got in touch with his wife. Not only did she give me the go ahead, but she was instrumental in making the day happen, helping me figure out everything from the best day and time to host the cash mob to being a decoy to taking over the cash register when things got crazy. Bharati and Avi behind the counter. So the very first thing I did was create a Facebook page to keep all the info in one place. There, I shared Avi’s story and why this mattered. I then reached out to the local paper, The Levittown Tribune, to put a mysterious ad in their community calendar one week before as well as encouraged one of their reporters to show up the day of. I also contacted someone at the Levittown Historical Society I knew to send an email to various groups and associations around town. A reporter from a local cable news station heard about the event this way and came the day of. Avi also helped with getting the word out – and he didn’t know it. I knew I wanted to reach the customers he saw day in and day out, but they were mostly older and rarely used the Internet. So I told Avi I wanted to interview people for my book about Levittown (which is actually true) and he called me each week with a list of people and their respective phone numbers. For three months, I called customers and told them about the event. Two weeks prior, I sent them a flyer via snail mail just to make sure they didn’t forget. Finally, one week before, I had a friend who lived nearby who agreed to put flyers in the mailboxes of 80 houses nearby the store. Combined, all of this outreach created a giant sense of accountability. The more people knew about it, the more real it became. This whole event was a beautiful collaboration between people I knew and some I didn’t. I had an editor friend proofread my copy for both Facebook and emails, friends who run an event business help me talk through logistics, a web designer friend create the flyer, a customer I’d never met lend us his tables, my sister and friends set up the day of, a friend of a friend photograph the event, video producer friends document the whole story, etc. People were more than willing to be a part of such a happy, community-oriented event if you only asked. I wanted to make this extra special. 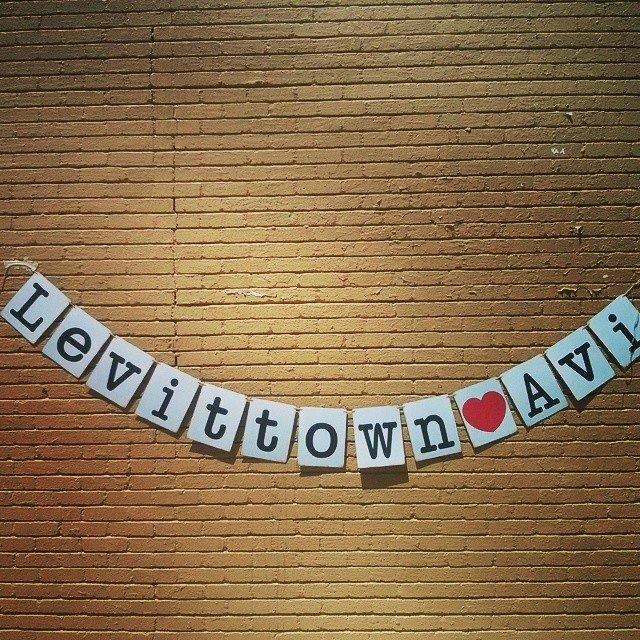 So I had a “Levittown Loves Avi” sign made in the NY font from Etsy, food from well-known and loved deli next store as a thank for participants, and my uncle bring flowers for Bharati from his florist shop. I almost bought a lifesize Indiana Jones poster with Avi’s head on it – most people who came in his store were familiar with the movie’s theme song as his ringtone – but others convinced me that maybe everyone wouldn’t get the joke. Good thing, too, because by the time the cash mob happened he’d gotten a new phone and given up the ringtone. From Etsy shop Happy Yellow Trading Co.
We wrote out a cue-to-cue (a method stolen from the theatre world) that gave a minute by minute run down of the day of and who was doing what. We considered everything from who was helping to watch our toddler daughter to how we’d line people up to at what point we’d walk in the store and bring Avi outside, as we were set on keeping it a surprise until the last possible moment. Truth is, there was so much going on the day of that I didn’t end up looking at the cue-to-cue much although I held it in my hand the entire time. By then, based on a friend’s recommendation, I’d practiced visualizing it all happening days before and so was familiar with the flow. Of course it didn’t go exactly as planned. We didn’t get a chance to encourage more people to make signs, we didn’t really need the pieces of paper with numbers on them to keep the line orderly, and we had to move the location of the food table because the sun was shining right over it. But nothing was too difficult and we adjusted as necessary. Encouraged by our video producers, we set up an “Everyone Loves Avi” Fundly account (also our hashtag for the day) so we could keep the momentum up long after the event ended. 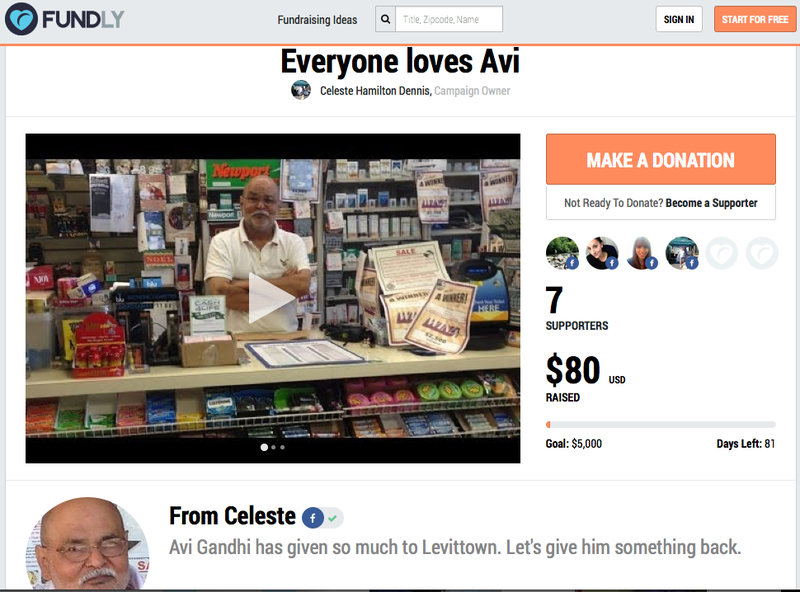 The goal of this was to buy Avi some more time, help offset some of the costs of the event, and spark the idea that this was possible for small businesses all over. It was always our intention that this event would inspire others in other towns to do the same. 1. Be savvy about choosing the date, and think about what other area-wide events might be happening. Because we lived on the other side of the country, our date was constrained by when we’d be in town which left a small window of time to choose from. 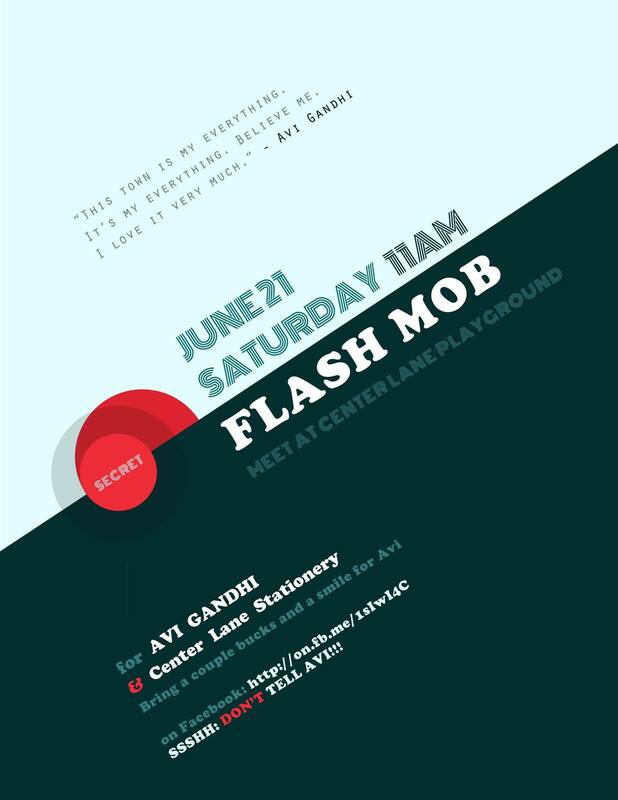 But I found out too late that the cash mob conflicted with Levittown high school’s graduation which prevented more people from showing up. Ooops. 2. See who will give you stuff for free. We spent a good chunk of money on food and decorations. I’m sure if we’d thought about asking the deli for example, we could’ve gotten the food donated or at least discounted. Duh. 3. Have extra support on hand. A big thing we failed to think about was how difficult it would be for Avi to receive so many people at once. Not only would he not be accustomed to an influx of customers, but a lot of the items had been sitting on his shelf for years and he didn’t know what price they were. At one point, when the store began filling up and he started to catch on, he got overwhelmed and told everyone to take things for free and go home. 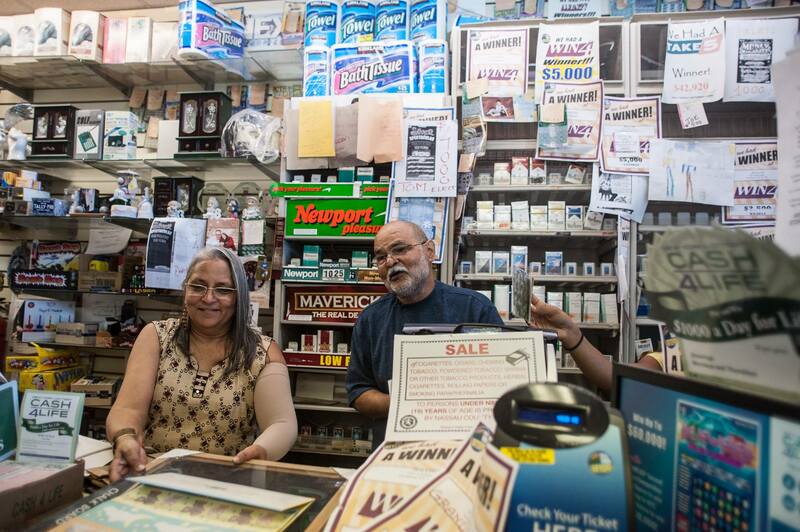 Luckily, Bharati stepped in and was able to calm him down and help with the register. But I wish we would’ve had Bharati or someone else ring people from the getgo so Avi wouldn’t have sweated as much. Have more questions? Feel free to get in touch: cellyham@gmail.com. Wish all the Best to Avi and all his admirers from the town. I’m really touch with affection and relation between them. Wish our government will take some solid steps against rent control to survive such small businesses all around US. I’m also witness of close down of similar stationary store of my father in law. Whose rent went from $5000 to straight $12000 per month with new lease in Green Point, Brooklyn. It came in Local News paper too , still government is sleeping. Hope no one else like him who live all his/her life to serve community has to give up his or her dream on sack of outrageous rent hike. I truly was inspired by this story. I try to live my nlife t o help others. When you see the good come out from years of bloving service it just renews my spirit in the human race. YES, there still is hope.. look up to Jesus, endless love will flow…. What a wonderful thing for the town to do . They Love you Avi ! May you continue to have success and prosper with your extended family . Happy Holidays to Avi and his wife , plus all your friends and neighbors ! This is a feel good story . Perfect for this time of year ! !